Across all industries, the top three financial objectives for using Digital Twins are grow revenue, boost operating margins, and cut costs. Digital Transformation has become the overarching topic among executive leadership in most manufacturing companies today. The batch and continuous process manufacturing companies and other asset-intensive industries such as mining, energy, utilities, and transportation, believe that the Digital Twin should be at the center of Digital Transformation efforts. This has led the technology community to focus messaging around twins at all levels, from automation companies to enterprise software providers and infrastructure suppliers. But unlike discrete manufacturing, the process and asset-intensive industries have no commonly accepted definition of a Digital Twin. 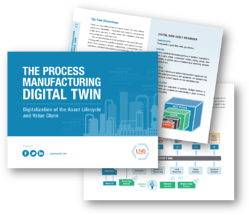 The challenge that many manufacturing organizations face is understanding exactly what a Digital Twin is (and what it is not) and how the industrial enterprise can gain competitive advantage using them.